How foolish of me... banging on the window of the handicap accessible bus to get the attention of the driver in the gray van driving next to us! Of course he can't hear, it's cold and the windows re all shut, and why would anyone look inside this bus? What struck me at that moment was that it was only two weeks ago his ex wife had almost run into me in the wheelchair as she raced around the corner just two blocks away from my house. I hadn't seen either of them in at least 6 years. They had sheltered me during the month of restorations after the house fire. When my cousin visited from Chicago he brought us a couple of things from his mother's vast collection that he thought we'd like. 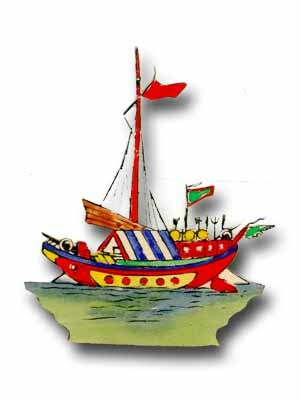 Only one item suited me, Chinese cutouts of boats hand painted in primary colors. A couple had people sitting or rowing the vessels over waves of blue/green. They looked still although captured in positions of motion. Something like my own state of being. I found an old sketchbook with graphs for room perspectives. It has little magenta figures with strings attached like puppets. The grid was the perfect device for theatrical settings, the boats both metaphorical and colorful. The boxed in quality is akin to the confined space of a monitor...to an institution...to being confined to a house, etc. etc. Layering papers gave them a mysterious and tactile sensuousness beyond a print/collage. It seemed a endless wealth of possibilities. There's a different part of the brain involved here. When one draws there's a primordial connection from head to hand. Like a child with finger paints after years of study. or aboriginal sketches on rocks. The emotionalism is transformed to a more logic-oriented resultant. I really tried to free myself from that machine-made quality. After a hundred pieces I settled on twenty or so as complete . The days meld into one another. Few exchanges with the distant past; a new arena forms. The tribute to Harry Chapin took place at Carnegie Hall with our group second row center. Paul Simon and Bruce Springsteen up close enough to breathe on. The Chapin family is a very strong willed and socially oriented unit. We had all worked intensely and creatively to make it the success it was! Ah theatre again. Kyle had introduced me to Sandy Chapin and her public relations/entertainment team. They had set up offices in her Victorian downtown Huntington home (versus her large waterfront estate.) It was always a treat to attend meetings and work sessions there; more often than not there was food and gabbing included. I designed the program and other collaterals. They gave me a long leash. Such rare clients...a huge bouquet was sent to my office the day after the event. Guess they were happy with the work! Julius and Terry invited artists from the North East to their sleep-in party at their huge Flicksville, Pennsylvania home. What a treat to actually have a New Year's Eve with friends, music, food and art. Once a lodge with a factory style ambience; we were instructed to bring sleeping bags and found spots on the floor. Met Doug Trump from Vermont, Michael Salerno and Felicia Telsey from NYC. All thirty or so guests were at least ten years younger than I. Could visit Vermont anytime. He lived with his teenage son in the quaint college town of Brattleboro, on the third floor apartment of a typical paint worn clapboard building built in the early 20th century. In deep winter a skaters paradise, veggie dining and beer. This period of art and life was a confused and ornery one for me. I see-sawed from watercolors, paintings and designing. Perhaps it was the bankrupt clients that caused my finances and emotional state to spiral downhill. Or was it the absence of children in my home, a truly empty nest without anyone else in it to give me stability? I spent a lot of time running outside drinking at local clubs and night spots. Did not like myself for the need to be with people, sometimes any people! Where did all this excess energy come from? 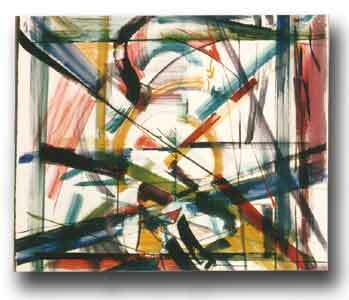 Waterstructure #1 (1988) free expression in large format watercolors. No changing midstream with that medium; loved to show off and dance with the liquid colors. Goodbye To Paradise (1988) was inspired by a book on Africa that I found discarded. 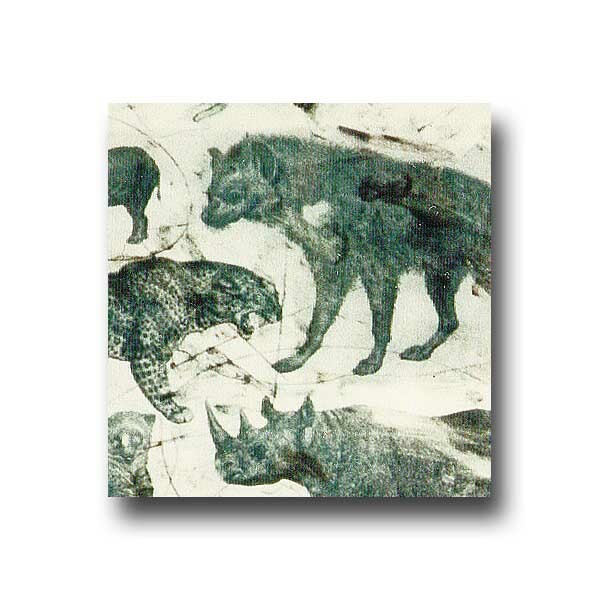 Written with photos by a famous Johnson husband and wife; a photo catches a rhino caught tripping off a flash! 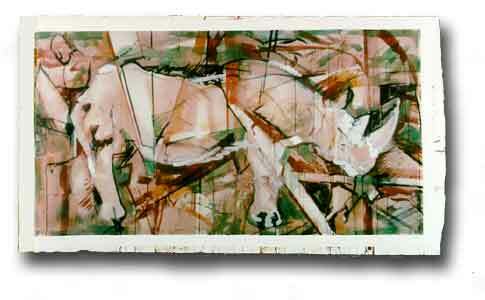 This watercolor was used for a poster and was the largest 45" x 78" (unframed) I had undertaken. An artist friend was especially adept at mounting and framing large works. Koyaanisqatsi Live at Tilles Center, LI with the Philip Glass ensemble. Dagna and I shared one of those life time experiences. Although a movie on the large screen, with live musicians in an acoustically perfect space it became mind altering. Whenever something implodes there I am again. Jean-Louis had introduced me to the film on video a year before. The French were usually ahead of us culturally, or so he'd say. New York City and I became intimate again. Attended a one semester class on Mac graphics at the Puck Building (Pratt Institute.) The first major school to tea ch it thoroughly. Once again a neophyte. Another Pandora's Box! 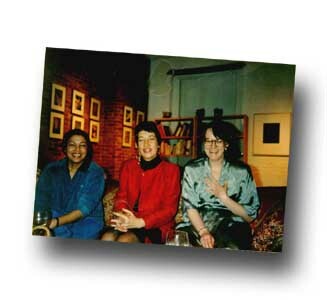 My NYC lady friends always had something cultural to do; drove in for brunch, theatre, forums and music. Stayed in uptown and downtown. Continued to work on multi media in between the bread and butter (no jam.) Will Prince Valiant Fall? (1988) was eventually destroyed, no place to keep it. Fortunately a photo appeared in the short lived Long Island Monthly. Elaine Benson wrote, "This is a sentient artist exploring hidden meanings. 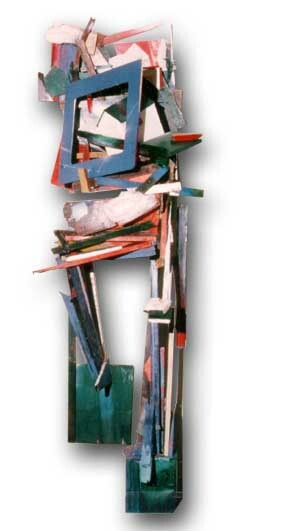 She is interested in contrasts and symbols, searching into her subconscious to create works with a monumental message. That she succeeds much of the time makes her someone to watch." Don't know who was watching. Started a class at NYIT in Mind Set and Amiga computers. The former was a vector platform the latter a useful drawing and sound card plaything. Created work from scratch and mimicked previous 2-D pieces for an evolution of sorts. Became friendly with Arnie Levin again. Intrigued with the Amiga as a tool for animated cartooning; he loved to explain process, helping me at the same time. 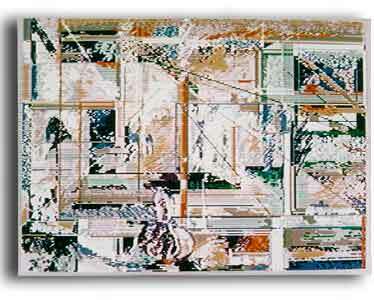 Arches (Interpreted) 1988 is a video transfer to slide to C-print mounted on foam core.